Max Haines-Stiles crosses the finish line at the San Francisco Marathon (July 31, 2016). Thousands of runners overtook the streets of San Francisco early Sunday for the 39th running of the San Francisco Marathon. 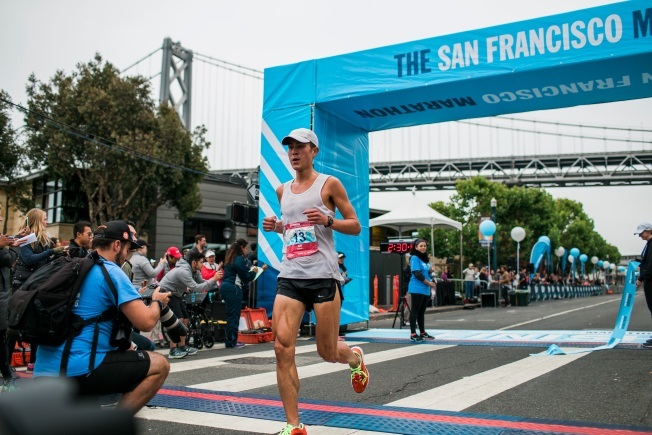 No records were broken in this year's main marathon event, but the winner in both the men's and women's 26.2 mile race was a first-timer and Bay Area resident, according to Bleacher Report. San Franciscan Max Haines-Stiles crossed the finish line first with a time of 2:30.42 in the men's race while Tori Tyler from Oakland led the women and broke the tape with a time of 2:49.51, Bleacher Report reported. Bay Area residents also faired well in the half marathon results, capturing three out of the top four spots, according to a San Francisco Marathon spokesperson. For those runners not near the top of the podium, they still were treated to a run along the Embarcadero waterfront, over and back across the Golden Gate Bridge and through Golden Gate Park before breaking a final sweat through the Mission District. Sunday's list of events also included two half marathons, one 5K race and one 52.4 "ultramarathon," according to the San Francisco Marathon website.